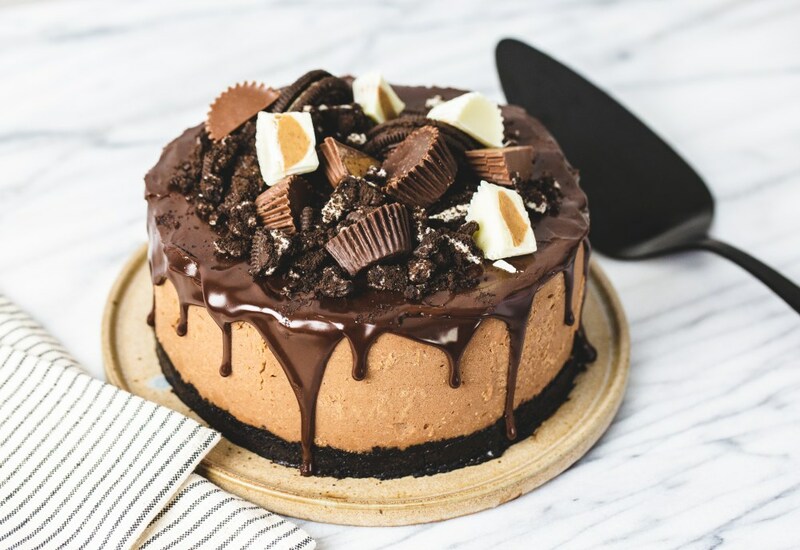 The perfect combination of chocolate and peanut butter come together in this pressure cooker cheesecake recipe. Chocolate and peanut butter flavor the cheesecake and then it is topped with homemade chocolate frosting and chocolate peanut butter cups, creating a decadent dessert for any special occasion. The pressure cooker makes it perfectly moist and dense and only needs to cook for 26 minutes! A foil sling is a quick and easy contraption that will allow you to lower the cake pan down into the pressure cooker. Start by tearing off a 12 inch x 12 inch piece of aluminum foil. Fold it in half. Fold it in half again. Fold it in half one more time! There, now it’s super sturdy to hold the weight of your frittata. If you want to see a whole step-by-step article, showing how to make the sling and what each step looks like, check out our article here. Per Serving: 672 calories; 45g fat; 66.0g carbohydrates; 10g protein; 105mg cholesterol; 318mg sodium. This was my first time making a cheesecake and my mom loves peanut butter, so I made this for her birthday. I'm not the biggest fan of peanut butter, but it was very subtle in flavor (except for the peanut butter cups which I actually like). I was very happy with how it turned out and was a hit! I’m not a peanut butter person but made this for friends. The peanut butter this was so subtle. The cheesecake was delicious. And decorations with cookies and mini Reese’s cups just made it look elegant. It’s a keeper! Wow, this actually turned out perfectly AND looked pretty much like the photo! I'm shocked but, no joke, this is an easy recipe that tastes great! I'm not a fan of peanut butter, per se, and would probably make the filling with a bit more chocolate next time, but this is a winner for sure.